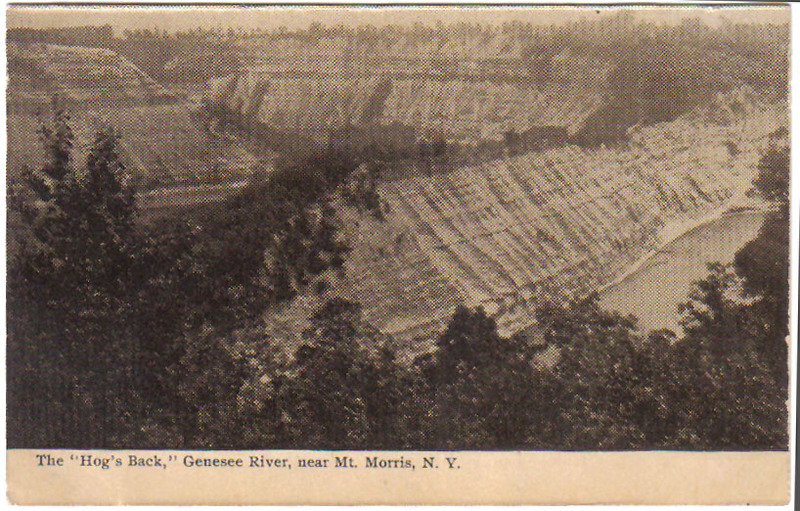 There are really TWO gorges in Letchworth Park. 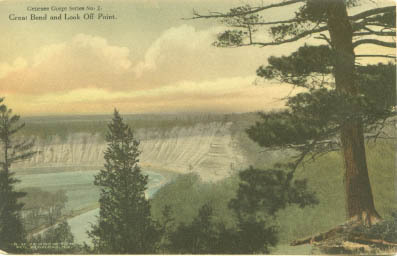 One is the Portage Gorge at the southern end of the Park. The other was the famous Mt. Morris Highbanks. 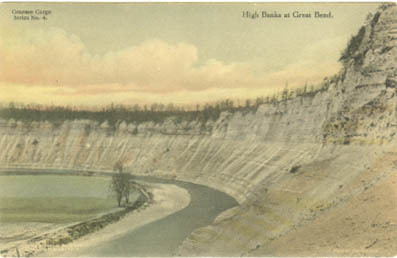 Although the Highbanks were not part of the original Glen Iris Estate and were not acquired by the State until later in the 20th century, they were always a popular tourist attraction. 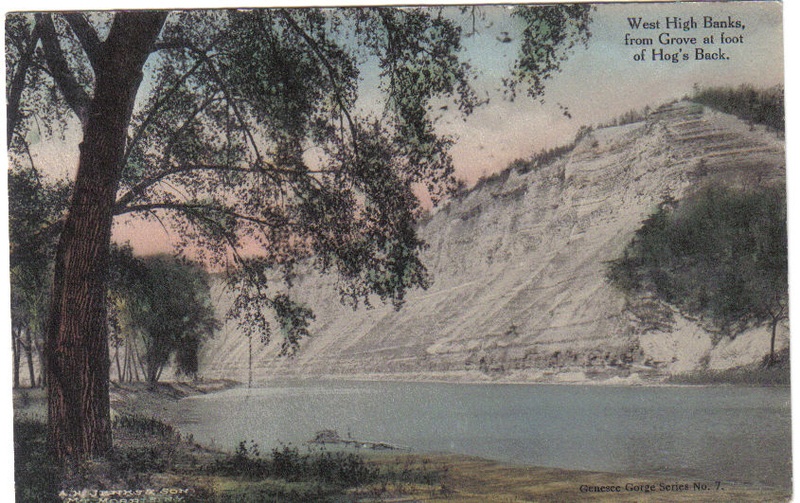 It is not surprising then, that a variety of postcards were published of the Highbanks. You will find below some of the postcards that we have in our collection. We have attempted to place them in order from Smokey Hollow going north, but some are difficult to place. Please see Part 2 for a current park map of the Highbanks area. The Mt. Morris Highbanks start just north of the Smokey Hollow area, south of the Highbanks camping area. 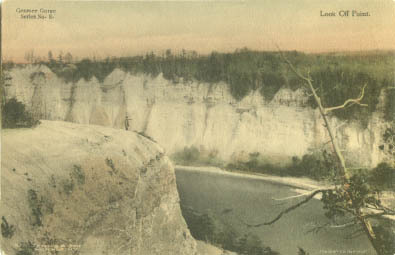 This real photo postcard and the one below were both taken before 1915. They appear to show the same general location as the card to the right. 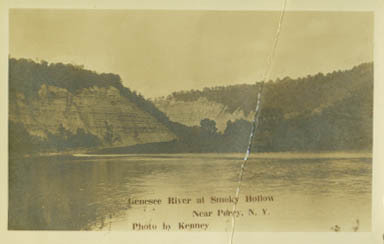 This card is labeled "Genesee Gorge Series, No.1. High Banks near Mt. Morris. It was published by the Albertype Co, Brooklyn, N.Y. in the 1920's and 30's. 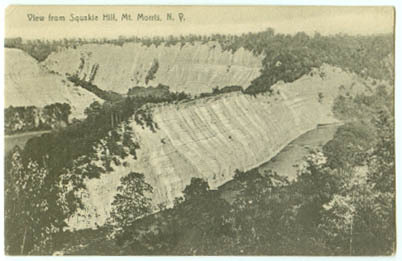 "Squakie Hill" was the name of the Seneca village and reservation that was located on the northwest side of the Highbanks. See the map of the Squakie(or Squawkie )Hill reservation for more information. 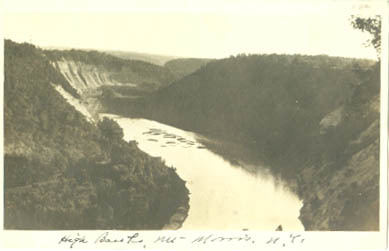 This postcard was taken looking west just downstream from the Hogsback, which is out of sight to the left of the photograph. 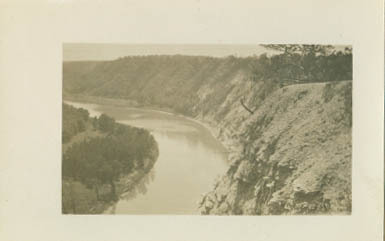 You will note the flat land in the gorge. This fertile piece of land was once used as a farm field and an old access road leading to it can still be traced on the east bank of the gorge. "Great Bend and Look Off Point" Incidentally, the term "Great Bend" is not usually used for this section of the Park - "Great Bend" or "Big Bend" is found just north of the Lower Falls area. 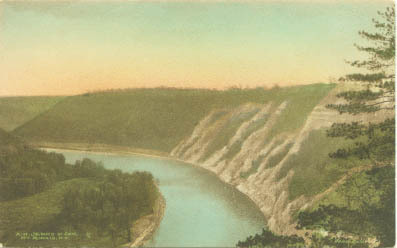 West High Banks, From Grove at foot of Hog's Back". 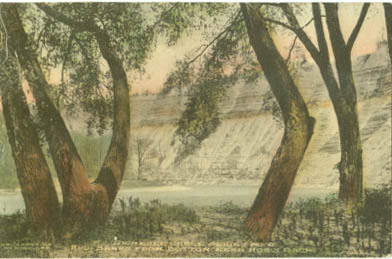 Part of this grove can be seen in the previous postcard in the lower right hand corner. The grove was lost in the high waters formed by the Mt. Morris Dam. If you examine the postcard carefully, you will see a man standing on Look Off Point. This beautiful viewing spot can still be reached from the Highbanks Recreational Area.